There's nothing monochromatic about this tune. If there's one man who might be able to solidify the divisional line between lovers and haters of the hard trance scene, it may very well be Yoji Biomehanika. Aside from his outrageous pseudonym and his even more outrageous neon appearance, this is the type of tune that mainstreamers will become annoyed and enraged with, while those who suckle upon the teat of trance will absolutely adore it. 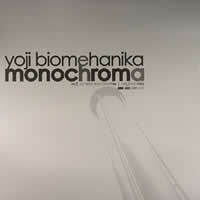 "Monochroma" is the final vinyl to spring from Biomehanika's excellent 2003 album, "Tales From The Big Room", and comes in both remixed form by fellow hard trancer Romeo Toscani as well as in original flavour. Romeo Toscani's remix is actually on the front side of this 12-incher, instead of Yoji's edition. Hmmm. Anyway, the track begins with a techy beat, followed by a suiting acid bassline. The remix continues into acid territory for a while, until about the two-minute mark when a background melody slowly fades in. Eventually everything comes to a halt and the pianos and main melody from the original sneak in and meld with the background tune for the climax. A key change, just as in the original, helps bring this song to a close. Overall, it is a decent remix, although it doesn't bring anything particularly exciting or fresh to the table. It is a standard remix, but nothing to shun either. The melodic aspect will be examined a bit more when I look at Yoji Biomehanika's Original Trance mix. On the flipside, the Original Trance Mix begins in a more straightforward fashion than could normally be expected from the man who is normally proficient in hard-hitting beats; I suppose he is simply showing off a softer side of himself -- nothing wrong with that. After a lengthy run with the standard bassline, a deep piano sample rolls on in, providing a rather melancholy atmosphere for a club tune. Floating pads follow, only adding to the brooding tone. The beats disappear for a while, leaving only the piano and pads to play, but soon a strange analogish synth comes in with a primary melody. It's interesting to say the least, and quite atypical of Biomehanika's usual fare, but it's also refreshing at the same time. The beat returns, creating a thoroughly funky spin. Finally, a key change creates a slightly different but nonetheless acceptable way of winding down. This is the version of "Monochroma" that I have become accustomed to, and I enjoy it very much. If I had to choose the more impressive version, it would have to be the original. Romeo Toscani's remix is decent, but it simply varies the original without adding adequate new material. Nevertheless, I feel that for those who are into hard trance, this would be a fairly solid release to check out, although hearing one of the two songs would suffice to get the general idea. It is melodic enough for the tranceheads but with hard beats for those who just want to headbang to something. Simply put, "Monochroma" contains a variety of elements that, when combined, can appeal to any listener of electronic music.